Do you know how hard it has been for me to write this?! How do you adequately articulate the feeling you get from people so talented at their craft that their music moves you to tears? ugh. This was supposed to be finished a month ago. Anyway. If you asked me to choose a favorite singer/songwriter (which is typically pretty difficult…there’s a plethora of talented people that play a variety of different styles, how can you pick just one? 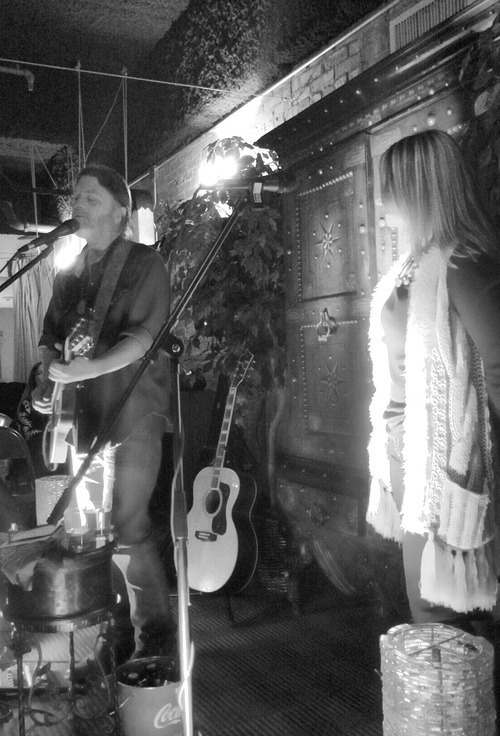 ), it would be Walt Wilkins. Regardless of circumstances, mood, time of day, etc., his music hits the spot…even if it’s a spot I didn’t know needed to be hit. It’s like getting wrapped up in the warmest, fuzziest of blankets, or as a few other people have described it before, putting on your favorite pair of well-worn blue jeans – comfortable & familiar. It soothes my soul in such a way that I just sit in awe of his gift. His wife Tina said “it’s like he has this direct line…” and gestured upward. Walt has this quality about him that makes you feel like you’ve known him forever. He’s humble, appreciative, kind, encouraging, and funny (photobombing mine & my girlfriends’ picture will always be my favorite story to tell). He and Tina are two of the most beautiful people I have ever had the pleasure of knowing, and it’s an honor to call them friends. He’s played and & co-written with/produced albums for Brandon Rhyder, Pat Green, Josh Grider, Jamie Richards, Bonnie Bishop, Owen Temple, Zac Wilkerson, Bobby Duncan…the list could go on for quite a while. He has seven solo albums, three Mystiqueros albums, a duet album with Tina, plays every Wednesday at the Saxon Pub in Austin, plays/hosts the Red River Songwriters Festival with Drew Kennedy every January…again, I could go on for a while. I’ve lost count of how many times I’ve gotten to sit through a variety of different shows (solo, song-swapping, trio, full on Mystiquero greatness, duets with Tina, etc. ), and since I’ve run out of ways to say how much I love this man and his music, I’ll just highlight a few of my favorite moments from recent shows. At Love & War in Texas – Plano: the staff and regulars here have become like family to me in the last couple years, so seeing my favorite and my friend on this stage is always pretty cool. Two of the Mystiqueros joined Walt for this show (Corby Shaub, guitar/vocals, and Bill Small, bass/vocals), and it was the first time “It’s Only Rain” made me cry. It was written by fellow Mystiquero Jimmy Davis, and I’ve never heard it performed the same way twice. I can’t remember now why I was in a funk walking in, but this song was played, and all was well. I asked Walt for a picture of the gorgeous artwork (done by Dan Taylor – who’s painting something for me & allowing me to get it tattooed as a half-sleeve!) 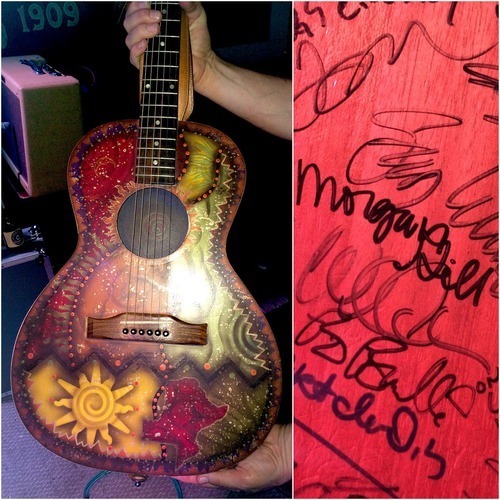 on the front of his guitar after the show, and he grabbed a sharpie and asked me to sign the back of it. I still don’t know what makes me worthy of such a thing, but holy moly. Another favorite was hosted by the Food Wine Song series. (if you live in DFW and haven’t heard of it, look it up now! Zac Wilkerson plays in a couple of weeks, tickets are cheap, and even if they weren’t it’s worth it! but I digress.) This was a listening room, so the people in attendance were there to actually listen to the music – a setting I prefer 9 times out of 10. These are moments that allow the artist to tell stories about their songs and families/friends that you often don’t get with a bigger audience. It also allows me to get completely lost in the music, which is much more difficult with people talking. It was a couple of weeks before Christmas, and Walt & Tina sang the most beautiful version of “O Holy Night”, y’all! breathtaking. I love love LOVE hearing the two of them together. 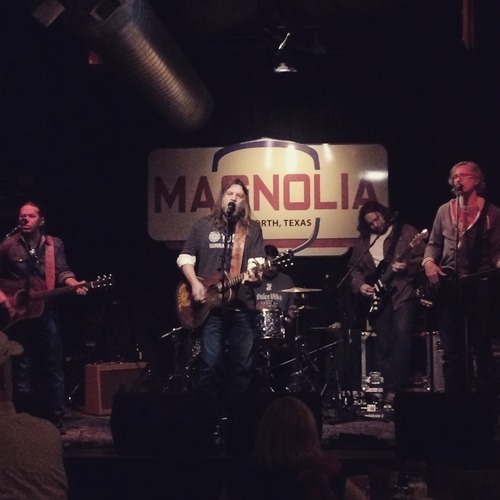 Most recently, Walt & the Mystiqueros (previously mentioned Corby, Bill & Jimmy, and Ray Rodriguez on drums) played at one of my favorite bar/venues, the Magnolia Motor Lounge in Fort Worth. This place also feels like home, and the people there are fantastic.Great service, great food, huge advocates of singer/songwriters. It was especially neat for me to see such a variety of people there, all moved by the same music. long-time fans and friends, first-timers, unsuspecting bar-goers. I got tired of standing, and sat in the floor in front of the stage for the last few songs. Walt asked what we wanted to hear, so I hollered “Someone!” because it is my favorite song, ever. They played, and I cried. The Mystiquero harmonies get me every time! Bone chilling. The song is so sad, while also sweet and hopeful. I will never reach a point in my life that I don’t cry when I hear “someone, somewhere tonight / just found their own wings / found some beauty, found some truth, found some meaning / in spite of it all.” The effect Walt Wilkins’ music has on me is ineffable. 1. incapable of being expressed in words. 2. too great or extreme to be expressed or described in words. That’s the best kind, really. Perfect. I agree completely. The guy is an amazing writer and musician, and a better person. I can’t wait for the next WW & the Mystiqueros show, or just WW, or any variation of, here in NTx. Its my Church. It soothes and calms me, yet I leave sky high and wanting more. God bless you all Mighty Mystiqueros. You are incomparable. Thanks for sharing your words w/ us, you couldn’t be more spot on. We are attempting to bring great music to Long Island, NY this next year and Walt Wilkins was are biggest goal. No offense to all the great artists out there but Walt has this ability to touch/reach people like nobody I have seen before! If you have any friends in the NY area tell them come check out Walt in August. all mates about this post, while I am also eager of getting experience. I simply want to tell you that I am just all new to blogs and honestly loved your blog site. Likely I’m likely to bookmark your site . You definitely come with excellent articles. Thanks a bunch for revealing your blog. fantastic publish, very informative. I’m wondering why the other experts of this sector do not notice this. You should continue your writing. I’m sure, you’ve a great readers’ base already!